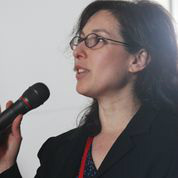 Esther Loewy is a founding partner of Bootcamp Ventures, whose mission is to createa unique platform for aligning promising technology start-ups with global investors,partners and customers. Bootcamp Ventures’ 18 global Innovation Summits since2008 - in five countries – has engaged emerging technology companies with leadingactive investors and decision makers in a unique deal oriented environment. Theimminent launch of the Global Innovation Xchange will be geared towards helpingcompanies –worldwide- upon graduating from accelerators. Esther’s experience includes investment strategies and global brand awareness for avariety of privately held and publicly traded companies in the US, Europe and Israelin the Internet, publishing, and technology sectors, including theglobe.com(NASDAQ: tglo), Power Paper and Alvarion. Esther provides strategic guidance,investment, negotiation, and branding expertise to innovative technology companiesand works intensively to cultivate relationships among global investors andcorporations. Esther holds an MBA from the Kellogg School of Management. Shewas invited to be a judge at Intel’s international student competition and serves asmentor to IBM’s Smart Camp; Esther participates on international panels onentrepreneurship and investment.